Banchory is the “country” part of Town & Country and is the administrative headquarters of the group, as well as being a busy small animal clinic. The clinic is fully equipped to carry out surgery, digital Xrays and hospitalisation of your pet. 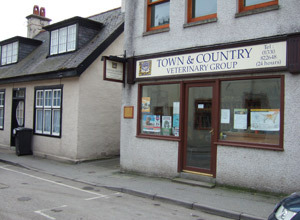 The veterinary surgeons based here are Liz Geraerts, Chris Wiper, proprietor of the group who took over here in 1990 and Neil Cockburn. There are four receptionists and our nurse to make up the team. Meet the team.